Note to self: Pleather and 80+ degree weather… not exactly a match made in heaven (disclosure: this outfit was from a couple weekends ago). Yes, you’d think this would just be common sense, but when you trust your iPhone weather app (never to be trusted, by the way) and it tells you it will be in the low-70s, sometimes you believe it even when all your other senses are telling you that you’re being stupid and relying on your damn phone to do all the work. It is possible to figure out the weather based solely on how you feel when you’re outside. Such a novel concept, no? That humans were able to survive before the advent of the smartphone. And to be fair, I really don’t think I am on my phone as much as some people (::cough:: ridiculously dangerous drivers of LA!!!! ::cough::)… there’s just something about that unreliable weather app that keeps me coming back for more. OMG absolutely LOVE LOVE LOVE that skirt... although maybe not in that weather lol. Pay no mind to the weather... air conditioning means you get to wear whatever you like! 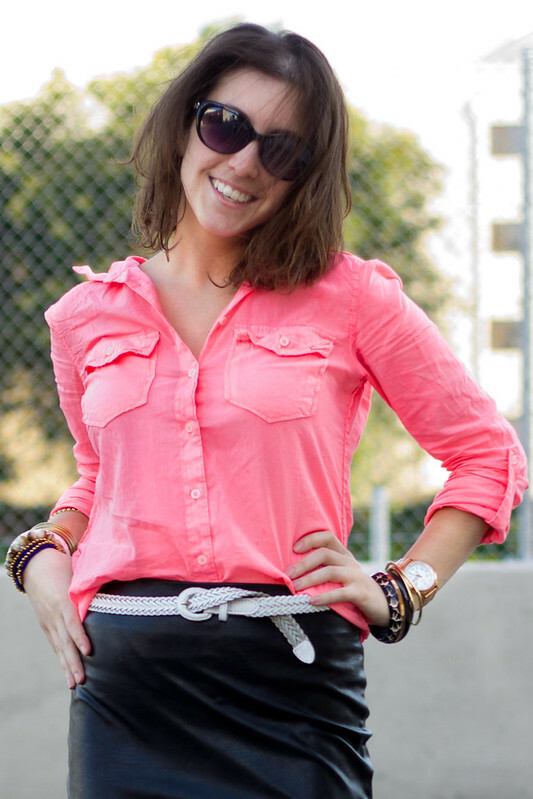 Wear my leather skirt all year long. I just like yours dress color and the shoes!